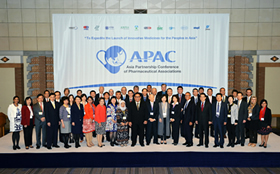 The Fifth “Asia Partnership Conference of Pharmaceutical Associations (APAC)” was held on 7th and 8th April with the mission of “To Expedite the Launch of Innovative Medicines for the Peoples in Asia” under the theme of “APAC’s continues challenge to create and improve access to innovative medicines”. Based on the agreements described below, JPMA is determined to overcome the various challenges through cooperation and close collaboration with the pharmaceutical associations, government bodies, regulatory authorities, and academia in Asia. 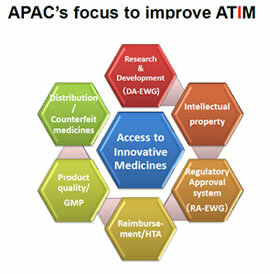 APAC will continue to take on the challenge of improving “Access to Innovative Medicines” (ATIM) in Asia, in cooperation with various stakeholders including the government bodies of each country. Specifically, we will continue efforts to address the issues of “Regulations and Approvals” and “Drug Discovery Alliances”, and will identify and address additional priority issues related to ATIM, with the aspiration of contributing to the health of the people in Asia. Promote information sharing, networking and capacity building in drug discovery in Asia by making the best use of established APAC DA-EWG platforms. Pursue drug R&D alliance opportunities to generate innovative medicines from Asia based on common understanding of strengths and features by academia and industry in Asia, as well as challenges that need to be overcome. The sixth APAC will be held in Tokyo in 2017 together with the 9th Asia Regulatory Conference (IFPMA). Innovation of new drug is the driving force to fulfil the unmet medical needs. IP, forms the foundation for innovation, and is most important to improve ATIM. In addition to DA & RA, APAC further discuss the possibility to set up a new EWG or project team. Good registration management roadmap (combination of Good Review Practices and Good Submission Practices) was endorsed in APEC Regulatory Harmonization Steering Committee (RHSC) in February, 2016. As a result, CoE pilot training is planned in November 2016. 3. To expand our activities toward Asian countries who have the will to be able to create innovative medicines.